Lock in a great price for Qi Palawan – rated 9.2 by recent guests! This property is truly a hidden gem. The instant I walked in to the lobby (after a free airport pickup by the hotel) I was treated to a welcome drink and the relaxation began. The property is remote essentially giving you a private beach, pool and lounge area. The seven cottages all face the water and were quite comfortable. They can help arrange transit into El Nido - $80 for round trip taxi service, but they also suggested a cheaper moto rental for the more adventurous! We went into town one day for island hopping and dinner and that wa more than enough. Once you get to Qi Palawan you won’t want to leave again!! The yoga was lovely, the food and drinks were delicious and reasonably priced. They have other activities both free (banka boats and paddle boards) and paid (island hopping, spa, kiteboarding). We loved the eastern side island hopping because there were no other tourists! The staff are charming and will help you book activities and find lost items. The quiet, laid back atmosphere made for a very relaxing trip. The staff was extremely helpful in every aspect and will pamper you. The resources to find activities such as tours was awesome as well. Management was incredible and very friendly and helpful. Thanks pete!! Very beautiful location. The food is very good, with a lot of options. Everything very clean, rooms are wonderful with outdoor shower. Nice daily activities on less crowded east side islands, perfect. Great for couples. 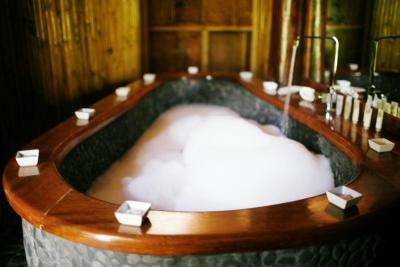 Try the aloe Vera bath and their daily morning yoga. The Team. Wonderful people. Francis, Icee most helpful. Audrice, the kite boarding instructor, amazing. Very nice place, beautiful beach. Lots of stuff to do. Will surely plan better and make a longer stay here. Beautiful location, loved how secluded and peaceful it was. The rooms were lovely, enjoyed the outdoor bathroom! Food at the restaurant and cocktails were very good. Pool table great. Staff were all friendly and very helpful. Great how they give you free insect repellent! The wifi does work at the restaurant area. We went into el nido town and did 2 tours there which were amazing but was great staying out of the hustle and bustle in our own little paradise as the actual el nido beach isn’t that great and the beach at qi is very nice and clear. The staff and food was excellent and I'm glad we stayed here rather than near to El Nido town which I wasn't too keen on. Qi Palawan This rating is a reflection of how the property compares to the industry standard when it comes to price, facilities and services available. It's based on a self-evaluation by the property. Use this rating to help choose your stay! A tucked-away retreat on the east coast of El Nido, within an hour drive from Bacuit Bay, Qi Palawan is a beach front property that features of an outdoor swimming pool, an open-air restaurant, and seasonal water sports activities. 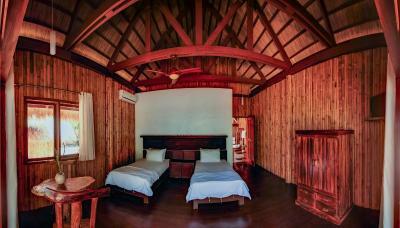 Each rustic cottage comes with a thatched roof and wood furnishings. They have on-demand movies, a safe and desk. 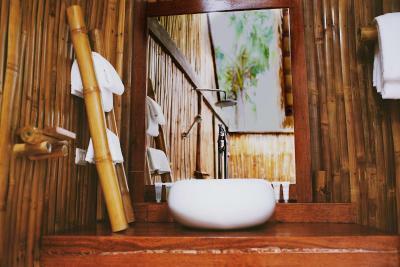 Private bathroom includes a hot and cold shower and free toiletries. 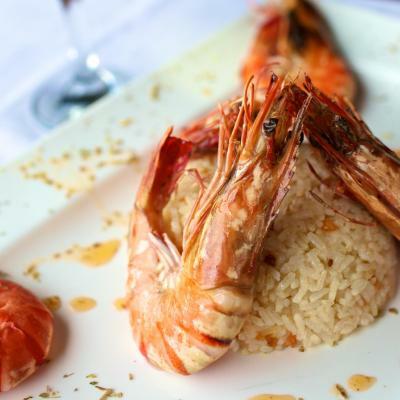 Mediterranean cuisine and healthy vegetarian options are served at Qi Restaurant. Free WiFi is also available at the restaurant. Guests have access to a private beach area. Complimentary recreational activities and facilites include billiards, stand up paddle boards, and daily yoga classes. Massage sessions can be arranged at an extra cost. Sibaltan Museum is a 10-minute drive from the property while El Nido town property is an hour drive away. The nearest airport is El Nido Airport, 50-minute drive from Qi Palawan. 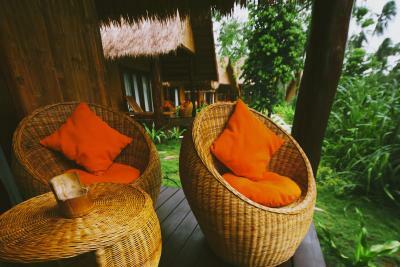 When would you like to stay at Qi Palawan? This family room features a patio, seating area and air conditioning. This twin/double room has a seating area, patio and air conditioning. This twin/double room features air conditioning, patio and seating area. House Rules Qi Palawan takes special requests – add in the next step! Qi Palawan accepts these cards and reserves the right to temporarily hold an amount prior to arrival. 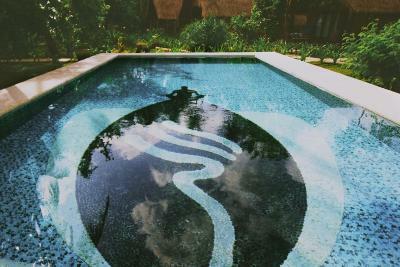 We recently experienced the most wonderful stay at Qi Palawan. This really is an absolute gem of hotel and we were so sad to leave! The rooms are beautiful and the outdoor shower was amazing. Showering to the sounds of the birds and the insects really makes you feel at one with nature. The restaurant is wonderful, some of the best food we experienced on our 3 week trip to the Philippines. We couldn't believe how reasonably priced the food and drink were considering there is no other restaurants or stores in the nearby area. Tip - you must try the seared tuna and basil mojitos! The beach area is beautiful and huge! You can really walk for quite a way. The beach itself was spotless, right from the resort area all the way through the little village further along. The staff are amazing and what really make this resort what it is. The managers are so attentive and genuinely care about your day and what you've been up to. All the staff just can't do enough for you. The trips and activities offered by the resort are incredible. We did morning yoga (free) and rented a kayak (free). We also took their island hopping trip which was the highlight of our entire holiday to the Philippines. Absolutely wonderful stay, thank you! There are very few issues with this accommodation. Check you know where the location is- it is about 45 mins from El Nido town. Wifi is intermittent but this suited us perfectly. When we stayed, the spa staff were having training. We both had massages but felt these would have been better in 2-3 weeks once staff had been suitably trained. Birds were nesting in our cottage roof and did occasionally come into the cottage- early morning- not an issue for us but it may be if you don't like birds! Amazing service and proper peace and quiet. A bit far from town, but provides the opportunity for a wonderful and scenic ride through the countryside into town each morning. Wonderful food, spacious rooms, great staff. A little too far from Elnido city. So if you plan to come here, make plans to be here. Where to start....! This was by far the best hotel/resort (for want of a better word - it's much smaller and more personal than this) that me and my husband have had the pleasure of staying in. Firstly, the location is perfect; it's very remote but this just means it's silent and peaceful and you can see the stars due to no light pollution....something i havent seen in several years due to living in central London! That being said, if you don't want remoteness all the time, we hired a scooter from the hotel which was also a perfect experience. About £12 a day, map and recommendations for local beaches and, most importantly, a trustworthy and safe way of hiring (no handing over of your passport, huge deposits etc). 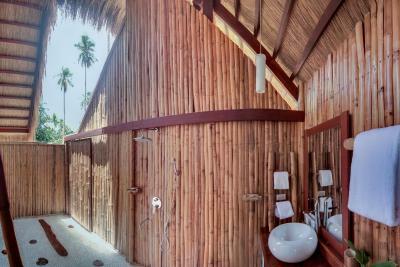 The villas were a dream; spotlessly clean and AC and we absolutely loved the outdoor bathrooms. We hired a USB to watch a couple of films one night too. The pool was lovely and in a perfect spot - a little suntrap but surrounded by trees and nature. Although there were sandflies on the beach, this didnt particularly bother us. They give you eco-friendly repellent to use but in our experience they werent too bad. One particular highlight to me was the food. I'm veggie and they catered perfectly - lots of amazing veggie curries, stirfrys, tofu steak etc. My husband eats fish and was equally pleased with the food on offer. The staff were also brilliant - very attentive and helpful. Finally, i couldnt recommend doing the island tour they offer more. It was perfect; quiet islands ( on one, we were literally the only people there), white sand beaches and crystal water. My friends thought i was in the Maldives from the pictures! All for less than £30 including drinks and a fresh BBQ lunch. Couldnt have been better. The room lighting is a bit dim. Quite expensive to get transfers to el nido town and back unless you have someone to share with, the resort seems to be over-inflating the charge compared to local transport costs. If you don’t get a flight to El Nido airport expect a 6 or so hour trip from Puerto Princesa which isn’t ideal after already traveling for hours. Staff are very helpful however and will organise transport there and back to make things as easy as possible. There wasn't much not to like. A beach barbecue and chill out area on the beach for the evening would make the place perfect but, it was a pretty awesome place to chill.